Value of card: Larry! Larry! Key 2009 stat: Larry! Larry! Braves' scouting report on No. 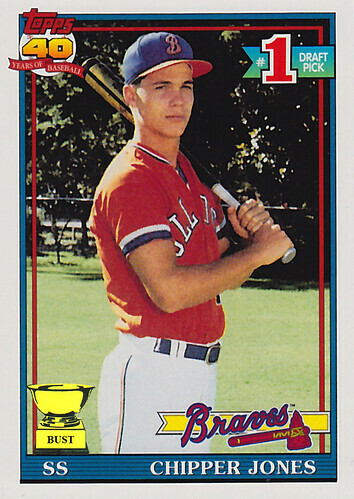 1 draft pick Chipper Jones: Swings bat well from both sides of plate, but definitely looks cuter on the left. ... Repeatedly punched scout in the groin after said scout called him Larry. ... Great prospect at shortstop, but would likely flounder at other positions, especially third. ... Huge, huge fan of Poison. ... Could drink Ted Kennedy under the table. ... Didn't seem to mind having his picture taken in a city park. ... Five-tool player, but only if he brings a hammer and saw with him. ... Swears he plays better with a packet of Pop Rocks in his mouth. ... He's quite squinty. ... Despite nickname, never really seems to be happy to see anybody.